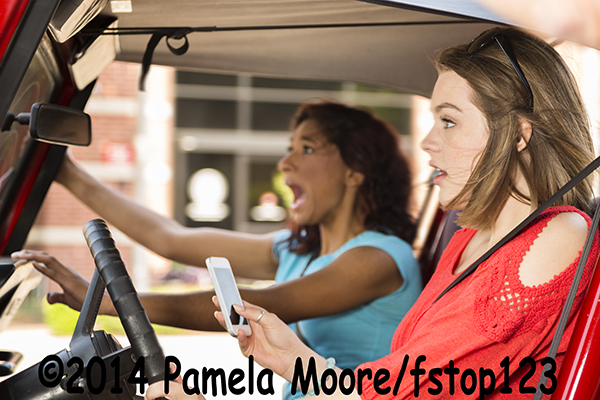 FSTOP123 - Outstanding Stock Photography - Driving Distractions! In looking at prevalent issues in today's 'high-tech' society, we decided to focus one recent shoot on the serious problem of "Texting while Driving" a vehicle. Our two models, portrayed everyday teenage drivers who are distracted by texting or using social media apps on their smart phones and not focused on driving. We wanted to bring awareness to this common social issue that is not only directed toward teens, but all drivers in today's technologically-advanced society. As stock photographers, we always strive to capture images that are relevant to today's buyer. With this shoot, we looked at this 'all too common' issue and took our models to a small town's downtown district on a deserted Sunday afternoon. Since no one was around, we were able to move around the city block and get many great shots. Using a fun, convertible jeep as our vehicle, we captured the essence of average teenage friends out for a carefree summer drive. The images above show a sample from this shoot of our models in various roles as they text on their smart phones while driving.